SHANGHAI — Shadows are rare in Shanghai, so a clear blue sky and abundant sunshine only added to a happy mood Tuesday at the HSBC Champions. Not that Lucas Glover needed any kind of emotional lift. Or Pat Perez, for that matter. They are among 17 players who have shown up for all three weeks of the Asian swing on the PGA Tour. Perez is among six players from that list who was at East Lake for the Tour Championship, which ended two weeks before the CIMB Classic kicked off this stretch in Malaysia. Jhonattan Vegas had it tougher. He made it to the Tour Championship and then played the Presidents Cup, giving him one week off before three events halfway around the world. That's one way of looking at it. Perez and Glover chose a different point of view. These three tournaments were short fields (78 players) with no cut that offered a combined $26 million in prize money. They were guaranteed a paycheck and FedEx Cup points, the currency for everything from keeping a tour card to making it to the FedEx Cup finale at East Lake. "We get off to a good start, who knows what can happen? And then the best happened," Perez said, referring to his four-shot victory in Malaysia. He followed that with a tie for fifth in the CJ Cup at Nine Bridges in South Korea. Perez already has 590 points, which would be the equivalent of 75th place last year in the FedEx Cup if he never plays another tournament. So it's been a good start, and he still has a World Golf Championship to play this week. Glover never imagined this kind of itinerary when he joined the PGA Tour in 2004. The season went from Hawaii in January until East Lake in late October and never ventured out of North America except for the British Open and a World Golf Championship in Ireland. "And now three out of my first four events are literally halfway around the world," he said as a matter of fact without a hint of complaint. Glover, the U.S. Open champion in 2009 at Bethpage Black, is on the road back from some dark places in golf. Coming off his third career victory in 2011, he was on a paddle board in the Pacific just days before the start of a new season when he took an awkward spill and injured his right knee. He didn't play for three months, and didn't play very well for the next four years. Only part of that was because of o his injury. He also developed the putting yips. "Oddly enough, the only thing I could do when I was recovering from my injury was putt," he said. "It's almost like I had too much time to think about it." His five-year exemption from winning the U.S. Open expired just as Glover was pulling himself out of a wretched slump, and he had to go through the Web.com Tour Finals to get his card back two years ago. He ended 2014 at No. 606 in the world. He spent five years out of the top 100 until September, when he tied for 12th at the BMW Championship. 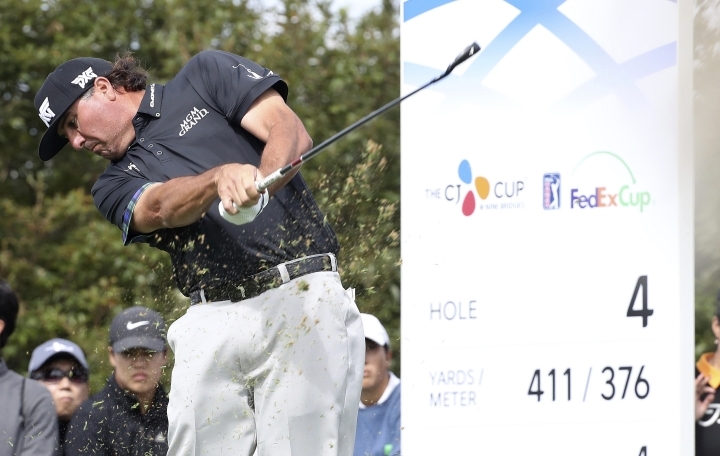 Glover fell short of reaching the Tour Championship, but No. 43 in the FedEx Cup marked real progress. "I don't talk about it much," Glover said of the yips. "I'm still going to miss some — everybody does. I missed some last week. I made them all in Malaysia. I'm hitting it good enough, and putting consistently enough, that it doesn't shine like it did. I don't get as anxious. It's been trying. But it's also gratifying. I played my way into the PGA Championship. I semi-played my way into here. For five years, I didn't do anything on my own merit." Those five years were from his U.S. Open victory, and the exemptions expired just as Glover was pulling himself out of his slump. He had to go through the Web.com Tour finals to get his card back two years ago. There was little chance he was going to turn down no-cut tournaments no matter how far from home they were. This is his first World Golf Championship since 2011. "It is a category to have the luxury to feel as though you don't have to come here," Glover said. "I couldn't afford to pass it up." Perez didn't want to miss it. He still can't believe that a year ago he got on a plane to Malaysia for his first tournament since shoulder surgery, knowing he had only 15 events to earn enough money to keep his card. Now he has two victories. He has earned nearly $6 million in the last year. He is up to No. 18 in the world. Perez played the HSBC Champions in 2009 and remarked one day when four people followed his group ("Three of them were lost," he said) that it only verified to him that he was "globally unknown." On Tuesday, one fan had a photo of Perez he asked him to sign. Another asked for a selfie. And he's not done. Perez is returning next January to play in Singapore and Dubai. "I would have given everything I have if you said I can have this for 12 months," he said, sounding very much like a 41-year-old who wants even more.